There is a growing interest amongst architects in the use of European Oak for external and internal cladding not only for domestic construction but also for much larger and more prestigious buildings. 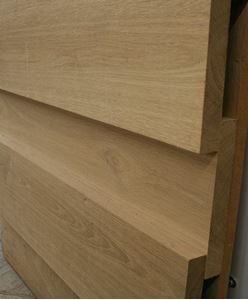 European Oak cladding provides an attractive, lasting and durable external and internal finish to buildings. 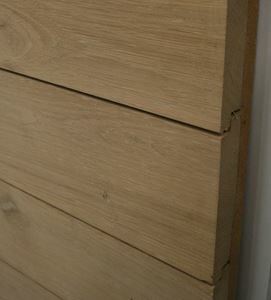 Horizontal layouts are probably the most common type of board cladding. 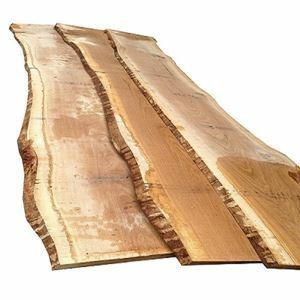 The boards can be used in a simple overlap design, feather or square edged or as a rebated feather edge or shiplap where a more flush surface is required. Unless stated our claddings tend to finish at 19mm thickness with random lengths of 2.1m & longer. We recommend using Stainless Steel fixings to secure Oak Cladding. 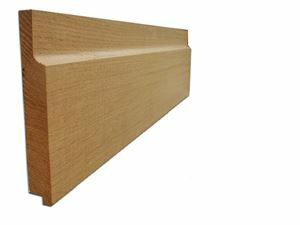 Please note all our cladding is machined to order except our Fresh Sawn Featheredge 200 x 28 tapering to 8mm which is usually a stock item. Please contact us for current lead times of our Cladding. Please note it is the customers responsibility to ensure there is means of offloading on site. 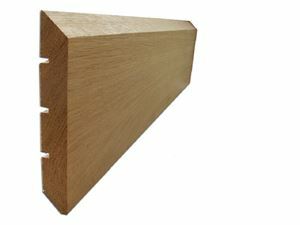 A traditional profile for cladding. Available in a number of different widths and grades to suit your requirements. 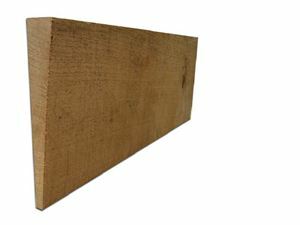 Waney Edge Oak - Random width boards 250mm & wider. The m2 area allows for a 50mm overlap on each board.